Herndon, VA, April 11, 2019 (GLOBE NEWSWIRE) -- The Center for Innovative Technology ( CIT) today announced that CIT GAP Funds has invested in Charlottesville, Va. company Metallum3D, developer of a web-based, metal 3D printing platform that provides accessible and affordable metal three-dimensional (3D) printing materials and services. 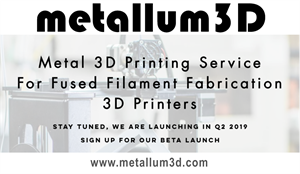 Founded in 2016, Metallum3D plans to use this capital to expand product development, move to a larger office space, hire key staff, complete the beta launch of the flagship product and establish partnerships with 3D printer manufacturers. Metallum3D combines low cost, high performance, Fused Filament Fabrication 3D printers with patent pending metal 3D printing filaments and Microwave Densification processes to create an affordable and accessible metal 3D printing service that delivers exceptional value when compared to the most common 3D printing processes that utilize either metals or polymers. For more information, please visit: https://www.metallum3d.com/. Recently named Virginia’s most active investor by CB Insights, developer of a tech market intelligence platform that analyzes millions of data points on venture capital, startups, patents, partnerships, and news mentions to predict future technology trends. CIT GAP Funds joined an impressive list of VCs, including California’s Andreessen Horowitz, New York’s Lerer Hippeau Ventures, and Washington D.C.’s New Enterprise Associates. CIT GAP Funds makes seed-stage equity investments in Virginia-based technology, clean tech and life science companies with a high potential for achieving rapid growth and generating significant economic return for entrepreneurs, co-investors and the Commonwealth of Virginia. CIT GAP Funds’ investments are overseen by the CIT GAP Funds Investment Advisory Board (IAB). This independent, third-party panel consists of leading regional entrepreneurs, angel and strategic investors, and venture capital firms such as New Enterprise Associates, Grotech Ventures, Valhalla Partners, Harbert Venture Partners HIG Ventures, Edison Ventures, In-Q-Tel, Intersouth Partners, SJF Ventures, Carilion Health Systems, Johnson & Johnson, General Electric, and Alpha Natural Resources. For more information, please visit www.citgapfunds.org. CIT GAP Funds has invested in Charlottesville, Va. company Metallum3D. The company offers affordable and accessible metal 3D printing through combined low cost, high performance, Fused Filament Fabrication 3D printers with our patent pending metal 3D printing filaments and Microwave Densification process to create an affordable and accessible metal 3D printing service that delivers exceptional value. CIT GAP Funds recently named Virginia’s most active investor by CB Insights.